since my good old navin minihomer stopped working in scotland (remember the indian man's course? ), i was looking for a replacement. seems like there is a new version with the same casing, but slightly different hardware and improved software, available now; produced and distributed by canmore, a taiwanese company. the little gadget called "canmore g-porter gp-102+", displays a lot more information, although the display-dimensions have not changed. it has a more structured satellite-signal amount/strength display, it even shows the current temperature and barometric pressure. also it can draw the track and you can view old tracks, and the two-button navigation has changed too - there's a long-press function now bound to each button; this makes navigation even more comfortable and faster. so i ordered one for an even lower price price as my old navin was. first test was walking around in the neighbourhood, tracking and testing, and getting familiar with all the functions. then i wrapped it in my gloves and stuffed them in my front pocket of my jacket. the track was still pretty accurate - excellent. the format of the tracks also has changed, it is now stored in ".fit" binary files, but conversion with "gpsbabel" works flawlessly, once the files got transferred to the laptop via usb mass storage mode. so far i am really happy with the new device, the size of a matchbox. 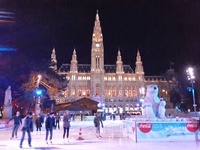 so after talking about going there for the last four years, we finally made it to the "vienna ice dream", a big skating rink in front of the town hall, with a total area of 8.000 square metres. also, it was my early valentine's surprise for nina. since it was during the week, there were not that many other visitors, so it was all nice and relaxed. after renting the ice skates we went on the ice. it took a while to get used to ice skating again; after all, the last time we both were on the ice was back in february 2012.
so we started slowly, always close to the barrier, so we would have something to grab a hold of if we would fall. but we did not, and so we got more confident with each round. then it was time for a break, so we grabbed a bite and had smoked salmon. the price was moderate and the food was really good. after a few more rounds we called it a day and went home again. 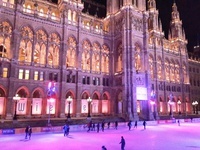 the "vienna ice dream" is really big fun; ice skating in the middle of the city. maybe we manage to get there again in 2017.
i did not bring my camera with me but i would like to share some pictures i took with my camera - of course the quality is pretty bad.